The Central Market Hall is the largest and most impressive indoor market in Budapest. 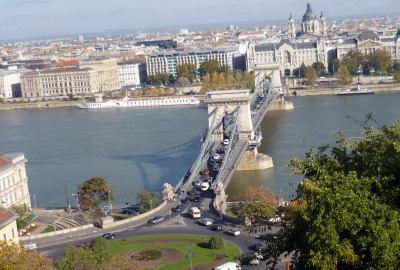 It is located on Fővam Tér 9, on the Pest side of the Szabadság Híd (Liberty Bridge). This spacious and beautiful market is a joy to visit, not only to see the huge variety of authentic products that is available but also to interact with locals and experience a bustling market day in all its senses. If you have enough time, consider visiting this market, a very unique Budapest attraction. 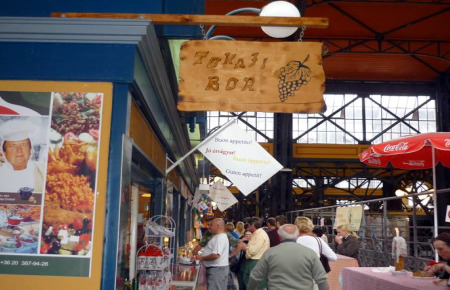 The Nagy Vasárcsarnok is a 3 level market hall that offers fresh local produce, meats, cheese , mushrooms, wines and all sort of Hungarian specialties. These and much more can be found on the ground floor of the market. The wide variety of vegetables, meats and fruits make the Central Market Hall a colourful and fragrant place not to be missed. The basement level holds a fish market, pickled goods stalls, as well as an Asian International Market where you can find all sort of exotic spices and products. The first floor houses handicrafts stalls where you can buy a great assortment of beautiful embroidery, folk wooden gifts, hand-carved chess sets, leather work, Russian matryoshka dolls and more common souvenirs such as magnets, t-shirts and mugs. Vendors are ready to give you a discount if you haggle, so feel free to get your best price.You will also find a food court with several coffee shops, a traditional Hungarian restaurant and Hungarian fast food stands offering authentic local meals such as sausages, langos (fried dough coated with sour cream or threaded cheese), goulash soup and főzelek (vegetable based stews). The impressive structure of this market is supported by thin steel columns and adorned with large glass windows that allow natural light to illumine the entire market.The red-bricked outside facade contrasts nicely with its gleaming roof of brightly coloured Zsolnay tiles. 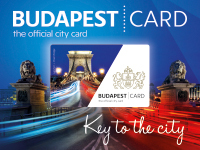 Why should you visit the Budapest Central Market Hall? The Budapest Central Market Hall is the perfect place to get familiar with ordinary Hungarians and their gastronomy, as well as to get an insight into local life. 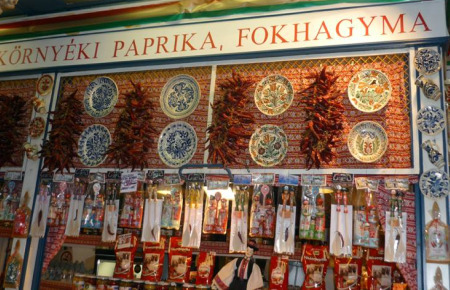 It is also the best place to buy authentic Hungarian delicacies such as Foie Gras (goose liver pate), paprika souvenirs in several version and packages, Hungarian salami, Tokaj (very sweet wine), Unikum (herbal aperitif) and Pálinka ( fruit based spirit). If you happen to drop by the Budapest Central Market Hall during your visit to Budapest, do not miss the opportunity to taste the traditional Hungarian palacsinta (crepes), langos and any other Hungarian treat, here at the Vasárcsarnok. How Can You Get to tthe Central Market Hall? You can reach the Central market Hall using trams numbers 2, 47 and 49. Alternatively, you can also travel by metro (line 3-blue line) and get off at Kálvin tér station, then walk towards the Szabadság Bridge. The market is just next to the imposing building of the University of Economics at the beginning of the bridge on the left side. 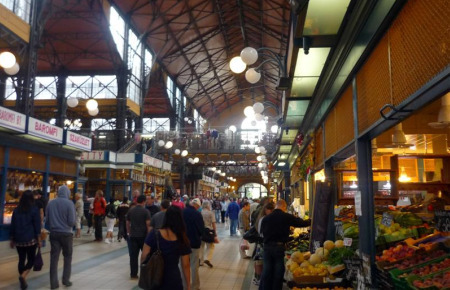 This spacious market was designed by the Hungarian architect Samu Pecz (1854-1922) and opened to the public in 1897, at the time when markets from all around Europe were organized and brought under roofs. The construction of the building began in 1894 but it wasn’t until 1897 when it was officially opened to public due to a fire disaster occurred a few days before the original opening date. During World War II a significant damage was caused to the building structures. 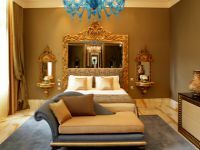 A revamp was done promptly but the construction lost its original and charming atmosphere. In 1991, the Grand Market closed its doors and went through a complete restoration process, mainly due to the serious structural damages suffered during World War II. Finally, in 1994 the Great Market Hall opened its gates once again to Hungarians and tourists alike and soon became one of the most remarkable buildings of Budapest .